Buying a new home is hard enough, but buying a home out of state often presents a few extra challenges. If you need a little help to make the process easier, consider inventory homes. Inventory homes, also known as quick delivery homes or move-in-ready homes, are houses that are already built or very nearly finished. They’re a great option for people who need to relocate in a hurry—for instance, to start a new job. Attractive upgrades: If you’re considering a home that is already under construction, be sure to ask about upgrades and additional features. Chances are, there are a lot of ways you can personalize your new home and really make it your own. Great neighborhoods: Our quick delivery and inventory homes can be found within MileStone’s beautiful, master-planned communities. These are located in some of the most desirable neighborhoods in the Austin area, including South Austin, Downtown, Leander, Cedar Park and Round Rock. No hassle: Quick delivery homes eliminate a lot of the hassles that eat up time and energy during the traditional homebuying process, which frees you up to focus on the other important aspects of moving. You still get to make some choices and customize your home, but a lot of the biggest decisions—like square footage and number of beds and baths—will already be taken care of. The price is right: When we list quick delivery homes for sale, it means we’re just as eager to sell as you are to buy. This often translates to a great deal compared to going the traditional construction route. So, if you’re in a hurry to move, don’t waste time and money renting while you look for a house—get a quick delivery home and get the ball rolling right away. We have dozens of inventory homes available right now, and more are being added all the time! You’ll find them listed on the Quick Delivery Homes page of our website, which should be one of your first stops if you’re planning to move to the Austin area in the near future. These homes are under construction as we speak, and many are nearly move-in-ready. 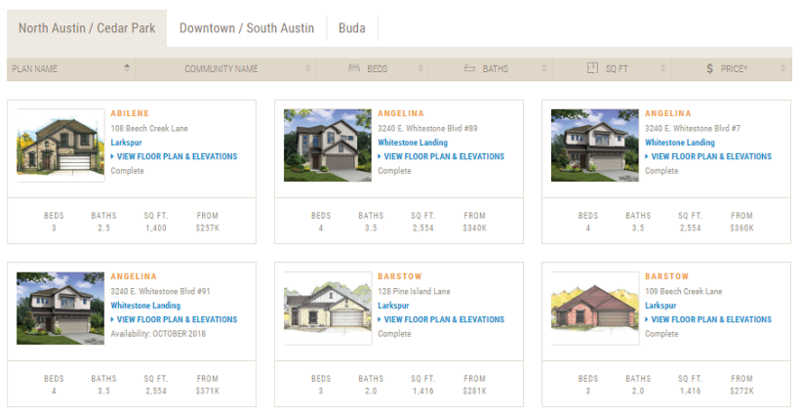 For more available homes in the Austin area, be sure to keep an eye out for featured Homes of the Week at various communities, each of which will be listed under the “Available Homes” section of the community pages on our website. It’s a great way to stay up to date on the latest deals from MileStone. If you’re buying a home out of state, quick delivery homes are the way to go! Contact us today to learn more about inventory homes in our communities. We offer great options for anyone buying a home out of state, whether you’re looking to live in the Texas Hill Country or at the heart of Downtown Austin.